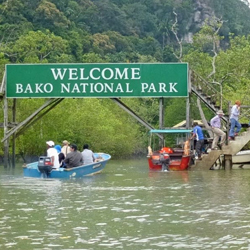 Gazetted in 1957, the Bako National Park is Sarawak’s oldest national park, covering an area of 2,727 ha. It is at the tip of the Muara Tebas peninsula. 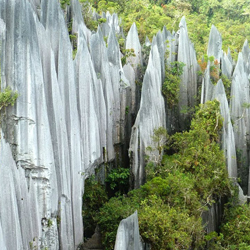 It is one of the smallest national parks in Sarawak, yet one of the most interesting, as it contains almost every type of vegetation found in Borneo. Designated as an Important Bird Area (IBA), (MY37), this national park has a fascinating variety of habitats including the Kerangas Forest, beach vegetation, grassland, mangroves as well as mixed dipterocarp and peat swamp forest. With its rainforest, abundant wildlife, jungle streams, waterfalls, interesting plant life, secluded beaches, panoramic rocky shoreline, bizarre rock formations and extensive network of trekking trails, the Bako National Park offers visitors an excellent introduction to the rainforest and coastline of Borneo. About 150 species of both resident and migrant birds exist here. Birdwatchers can pick between the park headquarters or the mangroves of Telok Asam as a good place to start birdwatching. The best time to visit the Bako National Park is from March to October when you get to see most of the resident birds and some of the migrant birds on their spring or autumn migration. Pink-necked Green Pigeon, Ashy Tailorbird, Mangrove Blue Flycatcher, Common Flameback, Sunda Pygmy Woodpeckers, Stork-billed Kingfisher, Collared Kingfisher, Chestnut-breasted Malkoha, Chestnut-bellied Malkoha, Red-naped Trogon, Long-tailed Parakeet, Emerald Dove, Asian Fairy Bluebird, Greater Racquet-tailed Drongo, Velvet-fronted Nuthatch, Rufous-tailed Tailorbird, White-chested Babbler, Ruby-cheeked Sunbird, White-bellied Woodpecker, Buff-necked Woodpecker, Red-crowned Barbet, Brown Barbets, Blue-eared Kingfisher, Oriental Dwarf Kingfisher, Fiery Minivet, Scarlet Minivet, Spotted Fantail. Gunung Mulu National Park near Miri, is a UNESCO World Heritage site that covers an area of 52,865ha encompassing an extensive system of rivers and streams, primary rainforests, and its limestone karst formations featuring enormous caves, vast cave networks, rock pinnacles, cliffs and gorges. Blessed with diverse natural attributes, it is home to a staggering 262 bird species, including all eight hornbill species found in Sarawak. If you are up to it, try hiking up the Summit Trail to Gunung Mulu to see many montane bird species including the endemic Whitehead’s Trogon and Broadbill. Red-breasted Partridge, Bulwer’s Pheasant, Whitehead’s Trogon, Golden-naped Barbet, Hose’s Broadbill, Bornean Whistling-thrush, Black-throated Wren-babbler, Bornean Blue Flycatcher, Bornean Whistler, Black-sided Flowerpecker, The variety of lowland forest birds found here also includes the Great Argus, Red-bearded Beeeater, Yellow-crowned Barbet, Short-toed Coucal, Jerdon’s Baza, Bat Hawk, Rufous-bellied Eagle, Jambu Fruit Dove, Green Imperial Pigeon, Large Frogmouth, Moustached Hawk, Black Partridge, Crested Partridge, Crestless Fireback, Crested Fireback, Checker-throated Woodpecker, Buff-rumped Woodpecker, Diard’s Trogon, Cinnamon-rumped Trogon, Raffles’s Malkoha, Red-billed Malkoha, Rufous-collared Kingfisher, Blue-eared Kingfisher. Established in 1989 and located about 22km from the Sarawak state capital of Kuching, Kubah National Park is arguably the most accessible nature and birdwatching site. This 2,230ha park is set around a sandstone ridge with its three mountain peaks and popular for its waterfalls and wildlife. Kubah is blessed with a variety of wildlife especially its 100 odd species of birds. There are a wide variety of trails such as the Main Trail, Summit Trail, Waterfall Trail, Selang Trail and the range, duration and features differ between 30 minutes walk to three hours, excellent for all levels of birders. 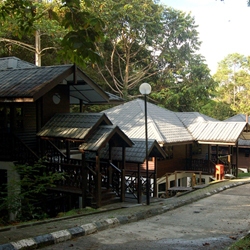 The park also has bungalows, hostels, rest houses and even longhouses for rent. There is a nominal park entrance fee of RM10 and your permits and information are available at the Visitor Centre. Blue-banded Pitta, Bornean Blue Flycatcher, Yellow-rumped Flowerpecker, Large-billed Blue Flycatcher, Bornean Black Magpie, Great Argus, Red-bearded Bee-eater, Chestnut-naped Forktail, White-rumped Shama, Brown Fulvetta, Spotted Fantail, Mangrove Whistler, Crested Jay, Red-naped Trogon, White-crowned Hornbill, Red-throated Barbet, Rufous Piculet, Buff-necked Woodpecker, Banded Broadbill, Green Broadbill, Raffles’s Malkoha, Rufous-collared Kingfisher, Blue-banded Kingfisher, Bornean Bristlehead, Bornean Wren-babbler.